My son Forrest in Ottawa reported last evening that the temperature in the frigid east was 25 degrees Celsius. He and Manon hiked in Gatineau on Sunday in t-shirts and shorts and returned home with sunburns. On the other hand, we woke to soft flakes of snow yesterday morning. When I went out to fill the birdfeeder, I surprised a varied thrush huddled in the woodshed. These are the birds that we listen for this time of year, their long slow whistle in the woods, varying in pitch, a sign that the season has turned. I don’t blame it for wanting shelter. It didn’t even fly away as I passed. Oh, we do have crocus in bloom, low valiant clumps of purple and cream, and a few of the dwarf daffodils showing yellow. And someone on the radio the other day mentioned violets in bloom on the lower Mainland. Not here yet. But Venus and Jupiter were both visible the other night in the western sky which cleared enough by bedtime for wishing on stars. 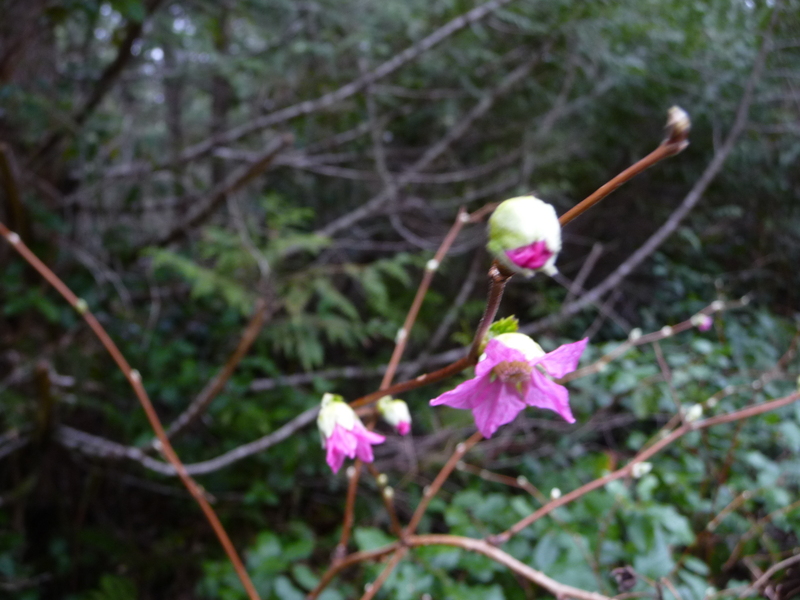 And this is what we saw on our walk yesterday, one of the best signs that spring has not forgotten us entirely, but is simply taking its own sweet time. ~ by theresakishkan on March 20, 2012. This entry was posted on March 20, 2012 at 7:54 pm and is filed under Uncategorized.You can follow any responses to this entry through the RSS 2.0 feed.You can leave a response, or trackback from your own site.